For select patients with hair loss – both men and women – getting a thicker head of hair can be as easy as putting on a cap. And no, not to camouflage the balding area. 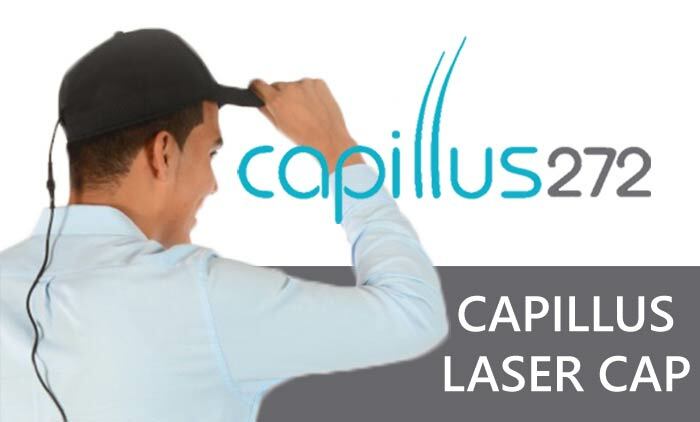 The Capillus 272 laser cap looks like a regular baseball style cap from a distance, but underneath it is a patented laser system, with 272 laser diodes that deliver low-level laser therapy to the scalp, to stimulate hair growth. It is an at-home treatment – a hands-free, mobile device that is battery powered and patients perform treatments at home or on the go. Any baseball cap size hat will cover the device. You don’t have to wear the provided Capillus logoed hat that comes with the system. How Long Do You Wear The Cap? 30 minutes every other day or as directed by your doctor. To achieve results with the Capillus you need to be consistent and use as directed. You also need patience. It does take several months and up to six months to see the full results of what the therapy can do for you. Once you are noticing thicker, more lustrous and stronger hair, you will need to continue using the Capillus to maintain your results. The FDA first approved low-level light therapy in 2007 for the treatment of mild to moderate male pattern hair loss for a laser comb device. But the laser comb is not as practical in application which leads to non-compliance and thus less than optimal results. It’s also not hands-free or mobile and only has 9 laser diodes compared to 272 with the Capillus. The first patient for whom the Capillus is recommended is a person who is just starting to notice hair loss and wants to catch it at the early stage. Capillus is also indicated is as a complement to topical solutions or medications such as Propecia as a combination therapy. Low Level Laser Therapy can make topical solutions even more effective. Lastly, the Capillus is excellent for use following a hair transplant procedure – to make the transplanted hair stronger and to prevent it from looking thinner over time as well as to strengthen the surrounding hair. The Capillus is intended to treat androgenetic alopecia – male and female pattern baldness. Besides the 272 Capillus Laser Cap, Contour Dermatology also offers a more affordable 82 diode Laser Cap that can help patients with very early hair loss or who just want to strengthen their hair. The first step is to get a consultation confirm this is the cause of your hair loss and not some other medical issue. We can then discuss your expectations for hair restoration and determine an individual treatment plan.